Okay, I’ve already spilled some ink railing against this application of the ngram viewer — using it to stage contests between abstract terms. In fact, I actually made this graph as a joke. But then, I found myself hypnotized by the apparent inverse correlation between the two curves in the 20c. So … shoot … here it is. 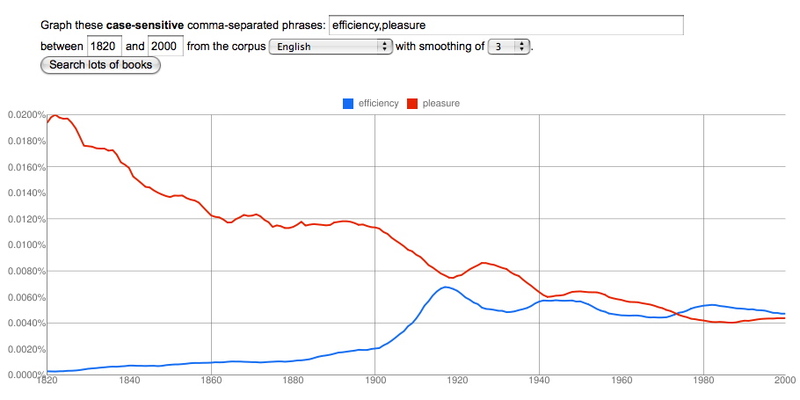 I have to admit that at first glance it appears that Taylorist discourse about efficiency in the 20th century (and perhaps the pressures of war) correlated closely with a sort of embarrassment about mentioning pleasure. But for now, I’m going to treat this kind of contrast the way physicists treat claims about cold fusion. It may be visually striking, but we should demand more confirmation before we treat the correlation as meaningful. When you hold genre constant, by restricting the search to fiction, the correlation is a little less striking, so it may be at least partly a fluctuation in the genres that got published, rather than a fluctuation in underlying patterns of expression.